Many architects yearn to stumble upon that perfect building – the one with so much promise, ownerless or ignored by its owners, left to the cruel devices of wind, rain and time. 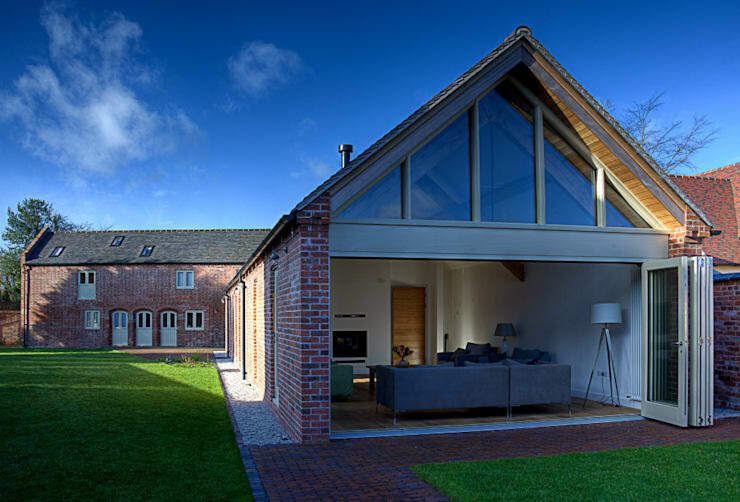 Alrewas Architects really managed to strike it lucky when they got the opportunity to renovate a forlorn farmhouse and its accompanying barn in Staffordshire, England. The two buildings certainly made a sorry pair in the past: neglected and dejected, they were the picture of dilapidation. But thanks to the creativity, talent and – it’s probably safe to assume – large amounts of elbow grease brought to the project by this firm, the buildings were lifted out of their downward spiral and not only restored but turned into something altogether new, different and very exciting. Take a look below to learn more. Almost the entire gable end of this building has been replaced with glass, both in the form of the folding doors that open all the way back to eliminate the distinction between outdoors and in, and in the form of the window above which stretches all the way to the roof and follows its vaulted line. The result is an extremely open and welcoming space, which would be perfect for allowing guests to drift easily between the garden and the house during summer barbecues or garden parties. Not just an arbitrary Spice Girls quote (not that there’s anything wrong with arbitrary Spice Girls quotes), but an apt description of one of the outcomes of the renovation. 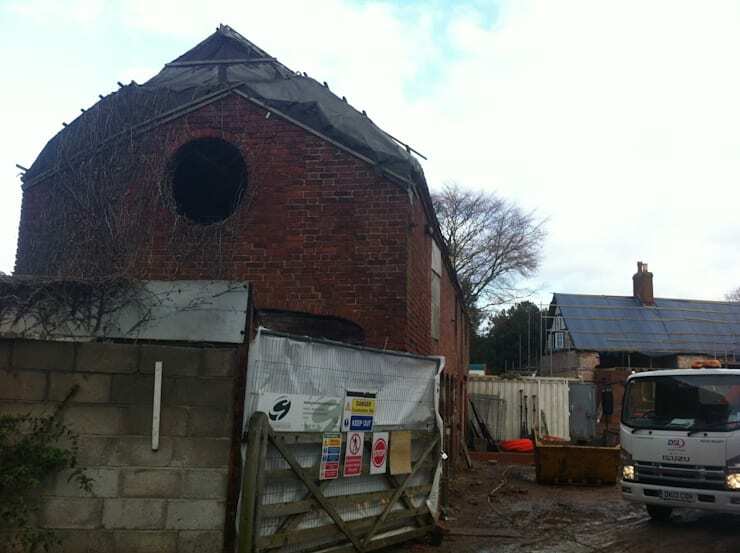 The barn and the farmhouse were originally two separate buildings, but as part of their joint restoration they were turned into one spacious family home. The key to achieving this was creating the slender little tunnel that now links the two, running down the centre of the two parts of the home like a waistline. Looking at this shot of the buildings seen from the same angle, but in their previous incarnation, it’s pretty much impossible not to be blown away by the vision and skill of the architects responsible for its makeover. Not only have the external shells of the buildings been given a contemporary update, but the interiors have as well. 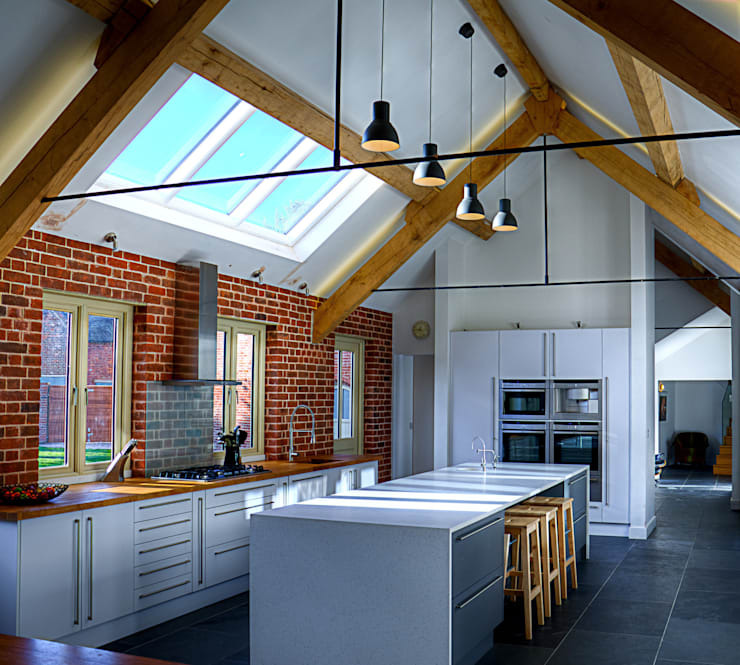 Making the most out of the original features, the vaulted ceiling, exposed beams and unpainted brick wall reveal the rustic quality of this structure. However, the overall feeling is very much of the moment, in part thanks to the huge skylights that flood the place with bright daylight. Simple, streamlined furnishing and walls unmarred by unnecessary adornments add to the effect. 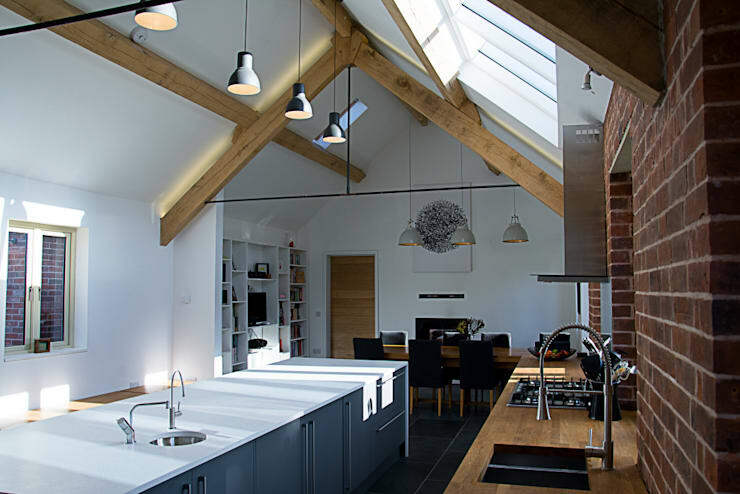 An open-plan layout makes the most of the generous dimensions of the space on offer. 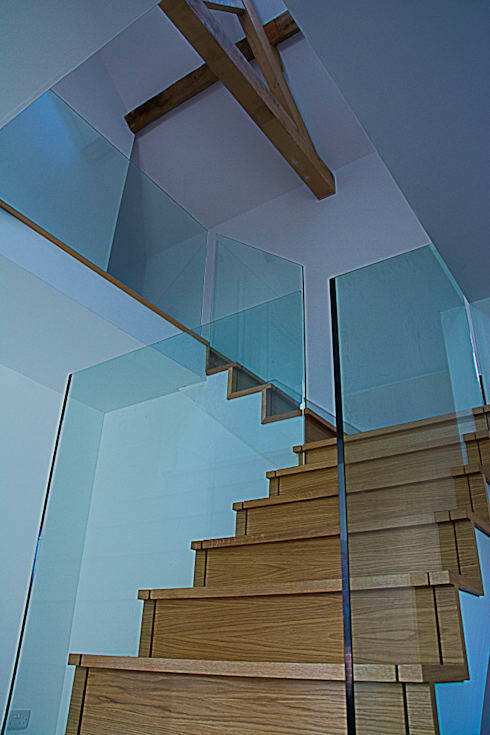 The shapes employed in the interior architecture are all absolutely modern, as is well exemplified by this shot of the very contemporary staircase. There’s no hint here that this space was a crumbling wreck not so long ago. What do you think of this project? Share your thoughts.